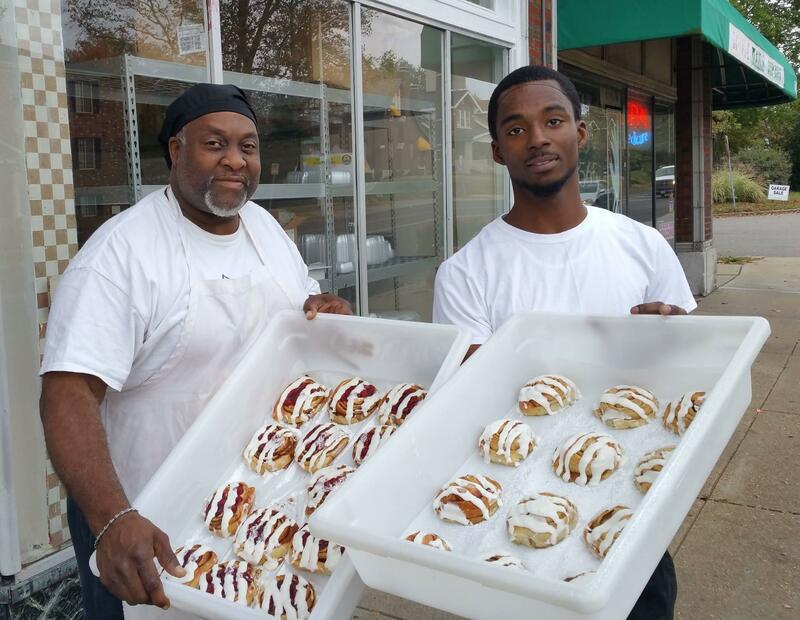 Two bakers pause for a photo with some of Bridge Bread's signature cinnamon rolls on October 25, 2016. Husband and wife Fred and Sharon Domke founded Bridge Bread in 2011 after Fred Domke had a dream about baking bread with people who are homeless. The couple had been volunteering with Bridge Outreach and participating in conversations with fellow church members about how to make a difference in their city. The Bridge Outreach was a homeless service agency in St. Louis that closed on June 30, 2016. Now in its sixth year, Bridge Bread has a commercial bakery and two stores, one in St. Louis and one in St. Charles. On Tuesday's St. Louis on the Air, Domke and baker Daryl Pitchford joined host Don Marsh to discuss the history of Bridge Bread and its small business approach to reducing homelessness. Bridge Bread founder Fred Domke and veteran baker Daryl Pitchford joined St. Louis on the Air host Don Marsh to talk about the organization's small business approach to reducing homelessness. Fred Domke explained that the mission of Bridge Bread is twofold: In addition to helping people who were homeless get back on track through employment, the organization also exists to engage with the community and change the stigma surrounding homelessness. Fred Domke founded Bridge Bread with his wife, Sharon, in 2011. Bridge Bread started as what Domke termed a “rogue” program that operated temporarily in the kitchen of a homeless service agency without official support. It eventually became an official program of that nonprofit, then an LLC owned by Bridge Outreach and finally an independent nonprofit. While there is a job training component to the program, employment at Bridge Bread is not necessarily transitional. Bakers can work there for as long as they wish. He explained that while the most pressing issue is usually finding suitable housing, homelessness often brings with it a host of other challenges that people may not consider. “Overdrawn checking accounts, utility bills that are unpaid, child support payments, quite possibly there have been … crimes of necessity, things like getting on MetroLink when you’re cold, and warrants … many things,” Domke said. Daryl Pitchford has been a baker at Bridge Bread for the past five years. Bridge Bread employs six bakers at a time (there is currently one vacancy), and when new trainees arrive, the first person they meet is Daryl Pitchford. Pitchford has worked at Bridge Bread for the past five years, and Domke emphasized the importance of having him act as a mentor to new arrivals. Pitchford explained that he was in a bad place before he came to Bridge Bread. He had recently become homeless when he happened upon the organization and became one of its first bakers. For the first several years of its existence, Bridge Bread relied solely on a network of churches to sell its product. Today, that network has grown to include 60 such institutions, and two dedicated Bridge Bread stores have opened in St. Louis, on Cherokee Street, and St. Charles, on Main Street. The signature loaves of bread, flavored cinnamon rolls, dinner rolls, brownies and baguettes sold at these locations are all made by hand, and Domke said their sales account for 76 percent of Bridge Bread’s annual income. About 88 percent of that income goes to bakers’ wages and ingredients, but paying for things like rent and utilities is only possible because of donations. In 2017, he hopes to expand the business to include a “mobile sales strategy” by creating a Bridge Bread food truck. 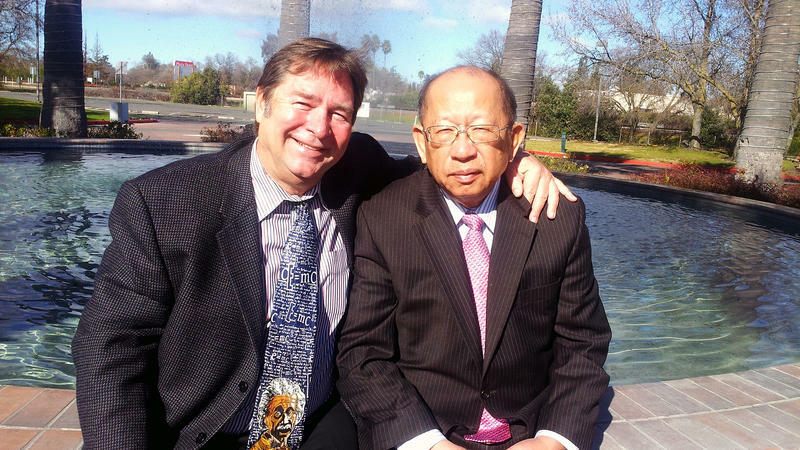 In California in the early 1980s, a cracked tooth sent Mike Williams to the dentist's office. When Williams asked to see the tooth, the dentist said he had a mirror but that there was no camera or anything to show people the insides of their mouths. So, Williams invented one: the first intraoral camera. His invention was a big success, and it led to other medical technology ventures that made him millions of dollars. Williams' career as an inventor and entrepreneur took off, but it wouldn't last. This winter, St. Louis County did something it hadn't done before - it opened a temporary shelter where homeless men and women could go to get out of the cold. It's a small piece of a 10-year plan to battle homelessness that St. Louis City and County signed onto in 2004. But obstacles remain to implementing the rest of the ideas in that document. St. Louis is the recipient of a $1 million federal grant to combat homelessness. The U.S. Department of Housing and Urban Development (HUD) is supplying the funds to rapidly re-house up to 150 people. Those who want to help the homeless—whether by offering a hot meal or a temporary bed—should focus instead on trying to find them a permanent home as quickly as possible. 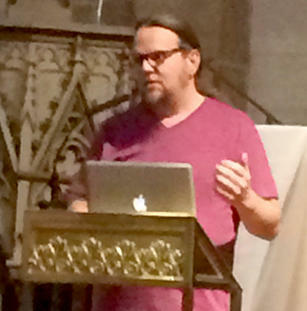 That's what researcher Iain De Jong told about 40 people gathered at Christ Church Cathedral in downtown St. Louis Thursday for a presentation on ending chronic homelessness.